The older I get, the more I find beauty in the dazzling displays of light and clouds that form the sunrises and sunsets of my life. They remind me of the passing of time, of things seen and to be seen. They can form the book ends of a memorable experience in a wild place, or in a day simply looking out the window here in the woods. And, true to form for me, I prefer the skies (and temperatures) of winter to those of summer. 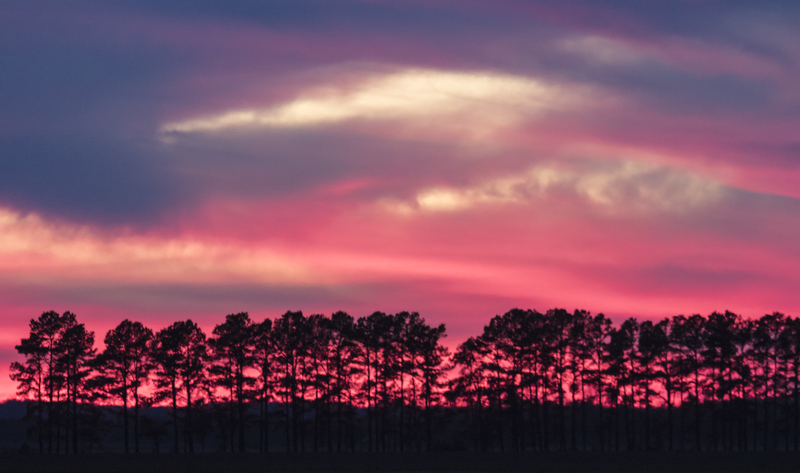 This past weekend, I had a group of photographers with me on a trip to Pungo and Mattamuskeet, and we were keenly aware of the majesty in the skies as we chased the light each morning and evening, and enjoyed the subtleties of color that paint our surroundings and the life that calls this big sky country home. 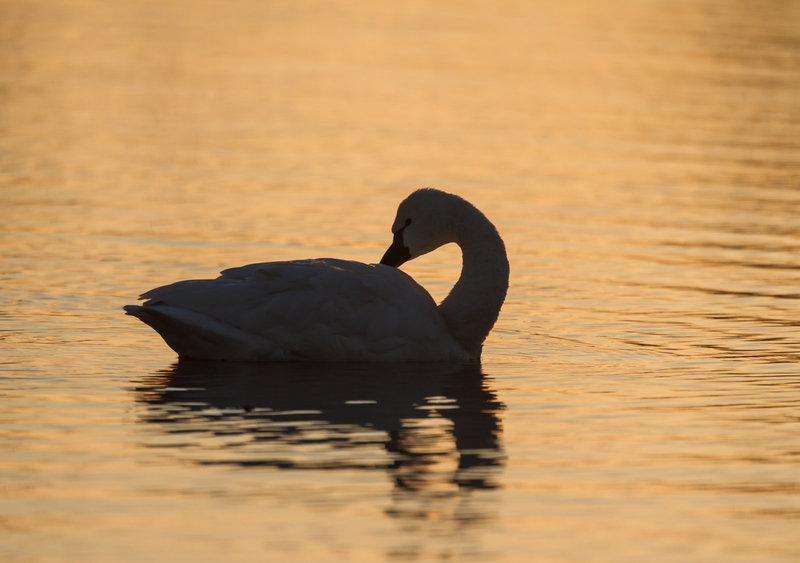 Later this week I will post about some of the extraordinary wildlife we observed, but, today, I just want to share some of the simple artistry we experienced at sunrise and sunset, surely the best times of day. These ephemeral glimpses of beauty help remind us what an amazing world we live in and how we should pause to enjoy it, to make it what we do, and to live in the moment. 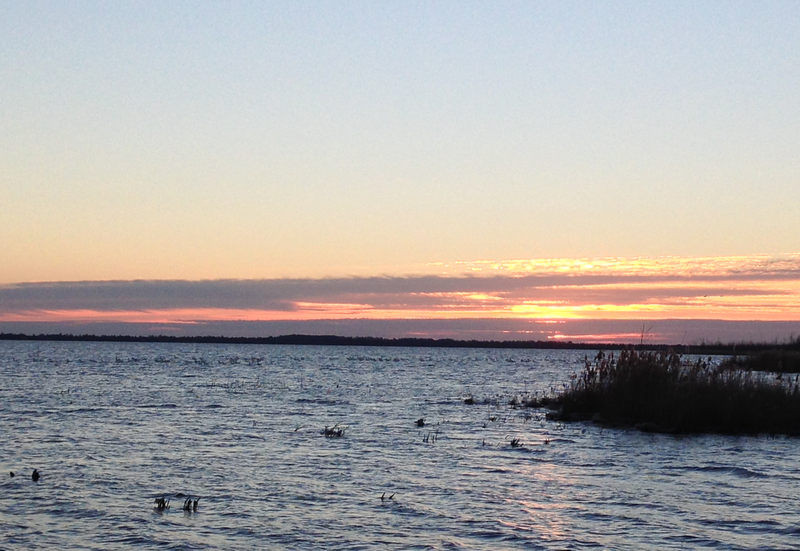 I had a trip to Pocosin Lakes and Mattamuskeet National Wildlife Refuges with a great group this past weekend. The birds have arrived (well, maybe not all the birds as yet) and it was a beautiful weekend of clear skies and warm weather. Too warm for my tastes, but I don’t think my friends minded. 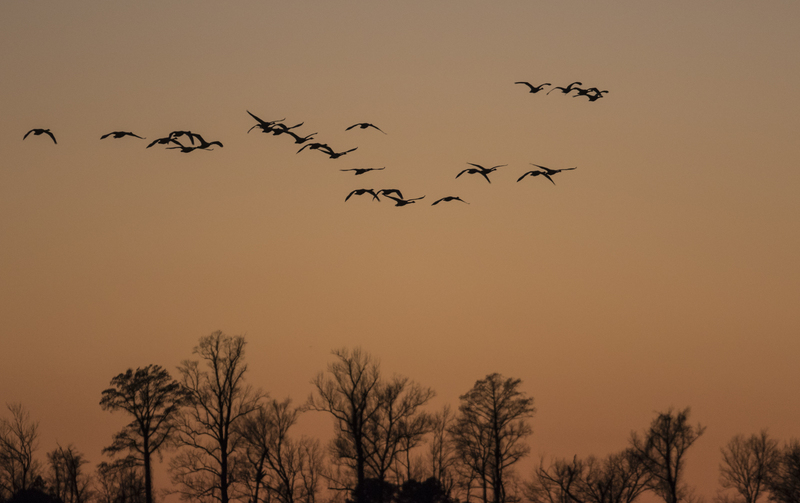 In addition to the wildlife, we enjoyed some beautiful skies, especially at sunrise and sunset. While almost everyone I know appreciates a good sunset, I find that many people are not fond of the concept of sunrise. A teacher that attended one of our Yellowstone workshops one summer (when sunrises are really early) sent me a cartoon whose caption summed up her feelings…the only problem with sunrise is that it comes too damned early. To make it even tougher for the dawn-weary, the 15-30 minutes just before sunrise are often the most spectacular in terms of color. Such was the case Saturday at Lake Mattamuskeet. 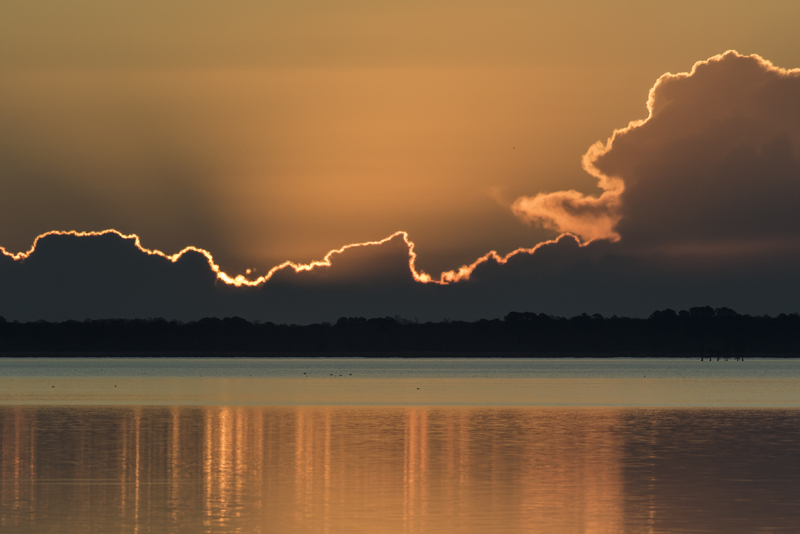 The usual spot for viewing the sunrise is the observation platform along the causeway (Hwy 94) over the lake. From that location, a small island of cypress trees provides a nice added element in any photograph. 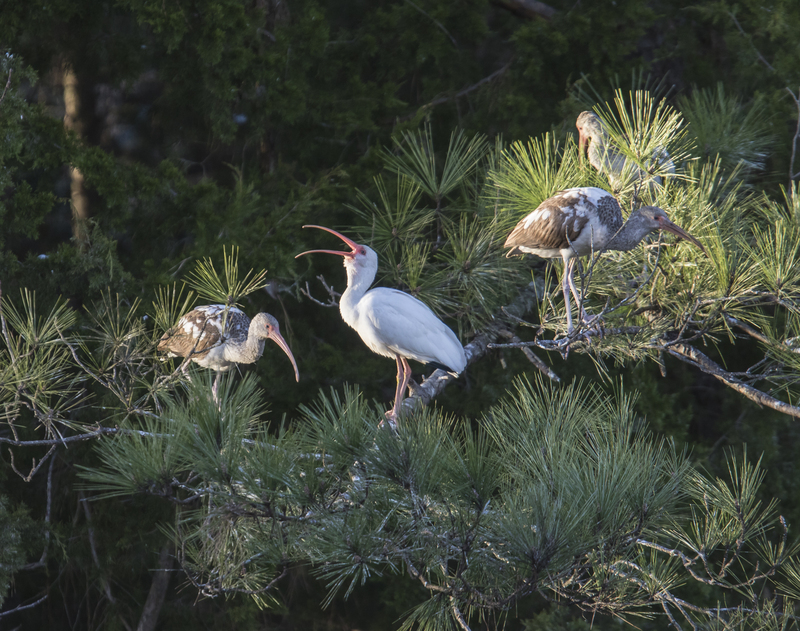 In fact, I think this may be the most photographed “island” in the state of North Carolina, based on the many entries in the annual Wildlife in NC Photo Competition that include this photogenic group of trees. As the sun started to peek above the horizon, the colors had subsided, and more clouds became visible in the eastern sky. Switching to my Canon 7D MII and a telephoto lens created a much different perspective on the orange orb coming over the distant trees. But, from what I have read, the actual sun may not quite be up in this photograph. Say what? Due to the bending of light (refraction) in the Earth’s atmosphere, we see the sun in a position slightly different from where it really is. If I understand this correctly, this effect means that we “see the sun” about two minutes before the actual position of the sun is above the horizon. 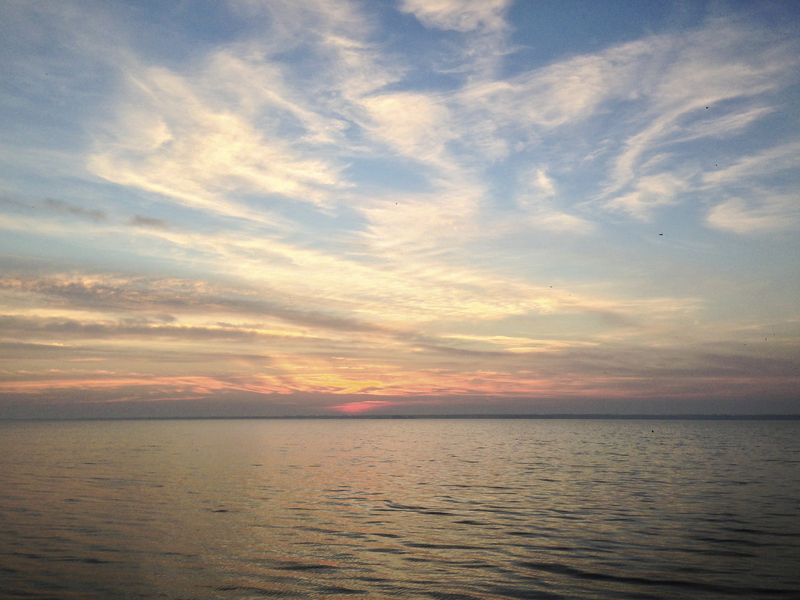 Back to just appreciating the sky…After a full day of wildlife watching, we headed back to Belhaven in late afternoon. 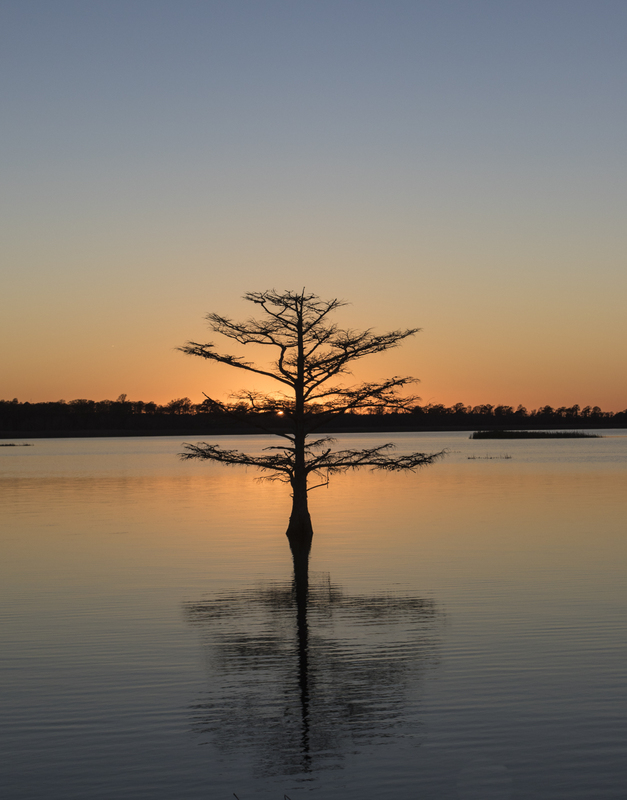 Cruising along the north shore of the lake we passed a perfect spot for a quick stop to appreciate the final light of the day, as watched by us and a lone Bald Cypress tree. 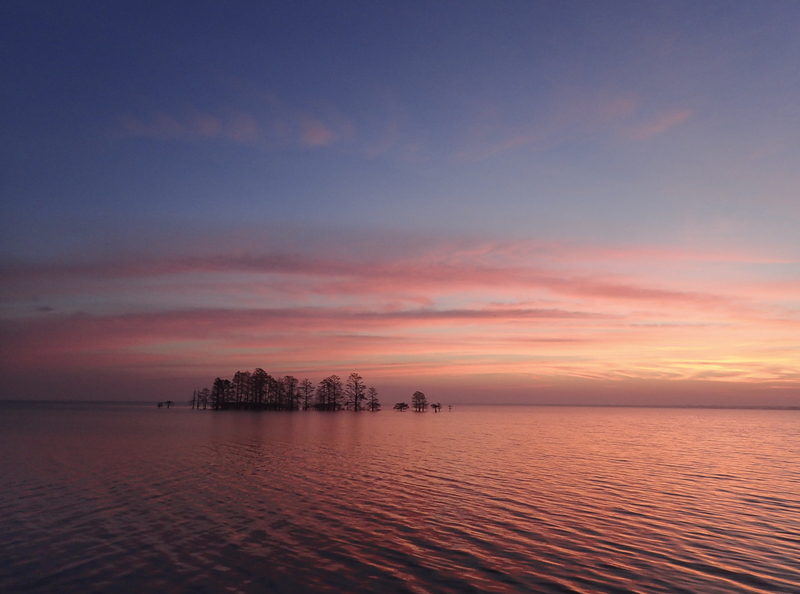 The next morning we were at the Pungo Unit of Pocosin Lakes National Wildlife Refuge. My car arrived first, and two of us got out and viewed the horizon as we waited for the remaining folks. 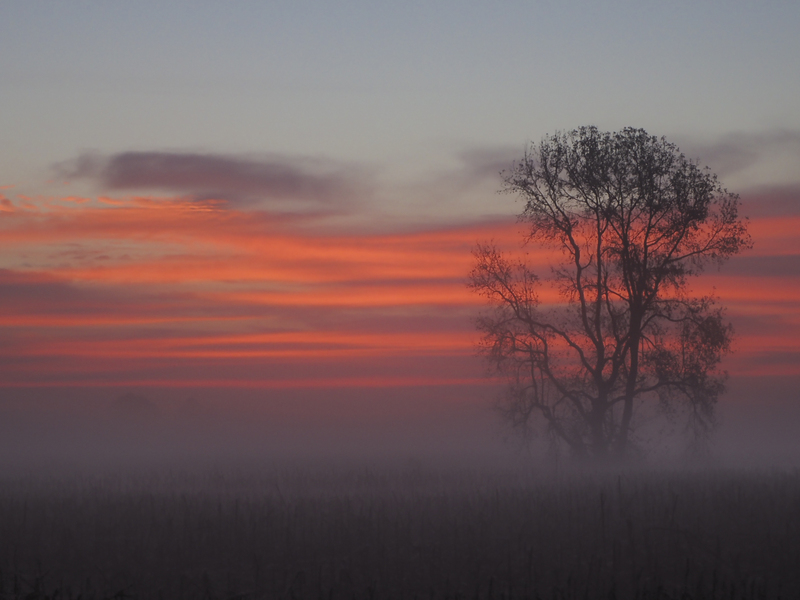 The sky was on fire and had the added beauty of a thin layer of morning fog hanging just above the ground. This type of fog is often called radiation fog. On clear, calm nights, especially in fall and winter, the land cools after sunset by radiating heat upward into the sky. This causes condensation in the air above the cooling ground. Under calm conditions, the fog will often form a thin layer just above the ground. 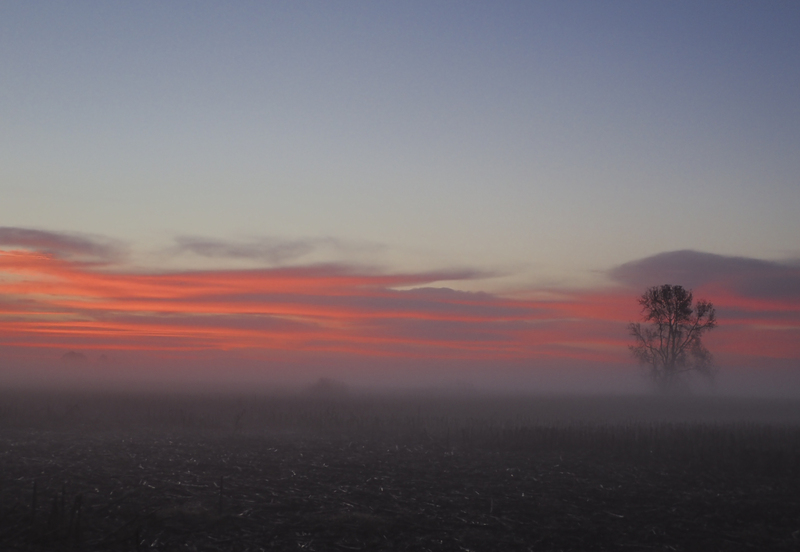 This type of fog usually dissipates shortly after sunrise as the ground warms back up. The striking colors of the the sky on this trip had me wondering,,,why do winter sunrises and sunsets seem so much more intense? A quick online search produced this confirming statement in one scientific article – In the middle latitudes and over the eastern half of the United States, fall and winter generally produce the most spectacular low-sun hues. In general, sunsets and sunrises tend to be more colorful because of something called Rayleigh Scattering. That is because air molecules tend to absorb and radiate (scatter) the shorter wavelengths of incoming light best. Since blue and violet are the shorter wavelengths in the sun’s spectrum of light, those colors are scattered in all directions first, which is why we see the daytime sky as blue. During sunrise and sunset, sunlight must pass through more of our atmosphere before reaching us, so it comes into contact with more air molecules and particulates such as dust. This longer path causes even more of the shorter wavelengths of blue light to be scattered from the incoming beam. That means that more of the longer wavelengths reach our eyes, resulting in a red or orange tinted sky. In colder months, the air tends to be dry and clear with fewer particles. That means more colors of the spectrum make it through to our eyes, resulting in more vivid colors early and late in the day. While I find all of this interesting, for me, the beauty of a winter sunrise or sunset is enough reason to be outside to watch them. And I must admit, sunrise is my favorite time of day. It is usually the quietest time since most of the world is still asleep, or at least still inside. It is a good time to think and to reflect on the importance of the simple fact of being alive to greet another day. It is also a humbling experience, especially when viewed in the big sky country of Eastern North Carolina, or out West, in places like my beloved Yellowstone. So, give yourself (and others, if they are willing) a gift of sky watching this holiday season. It is simple, really. Make time to get outside at the right time of day, take a deep breath, and enjoy. I especially encourage the gift of a sunrise with the addition of a warm coat and a steaming mug of your favorite morning beverage. You won’t regret it. 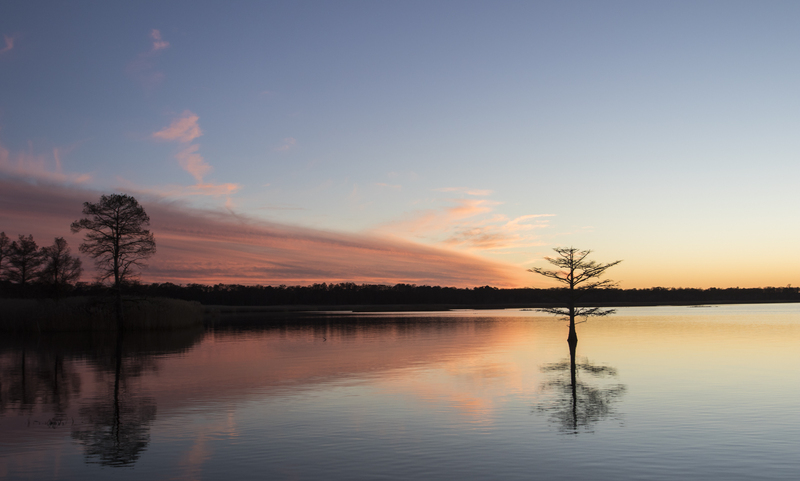 The centerpiece of this portion of Pocosin Lakes NWR is Pungo Lake. 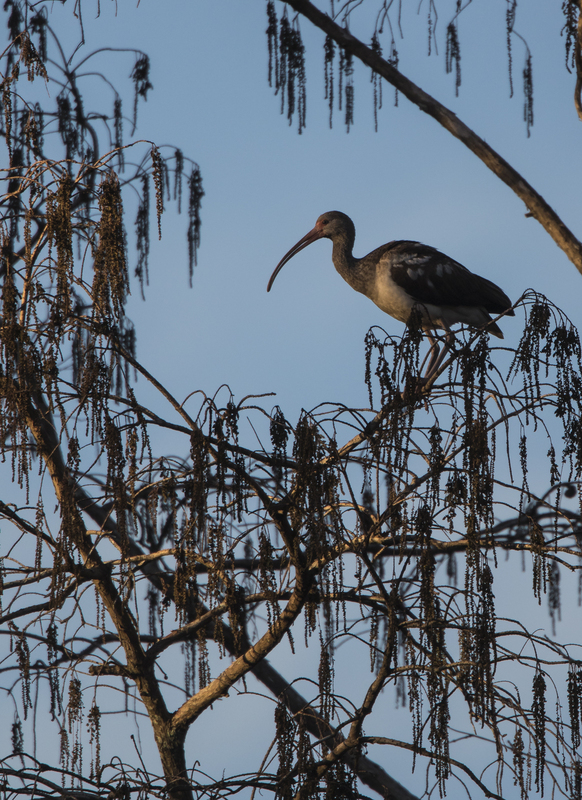 it is approximately 2800 acres, making it much smaller than nearby Lake Phelps (~16,600 acres) and Lake Mattamuskeet (~40,000 acres). 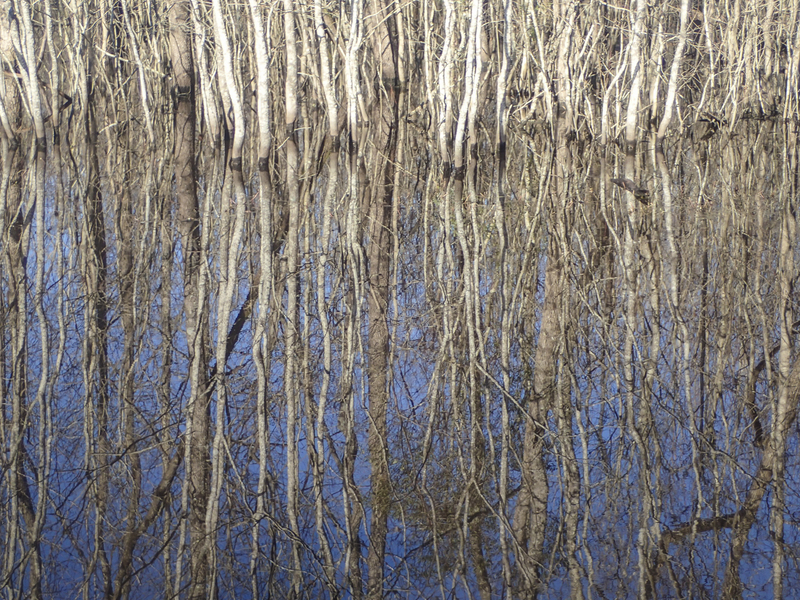 All are shallow with average depths of no more than 5 feet, but Pungo Lake is very different in one important aspect. 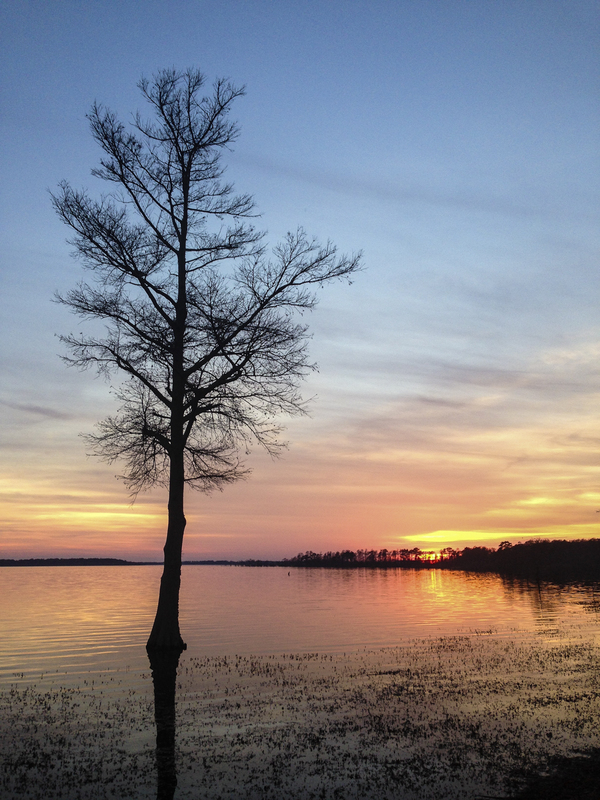 Unlike the other two, which have sandy bottoms, Pungo Lake has a peat base. This makes these waters very dark due to both suspended particulate matter and the tannic acids associated with peat. 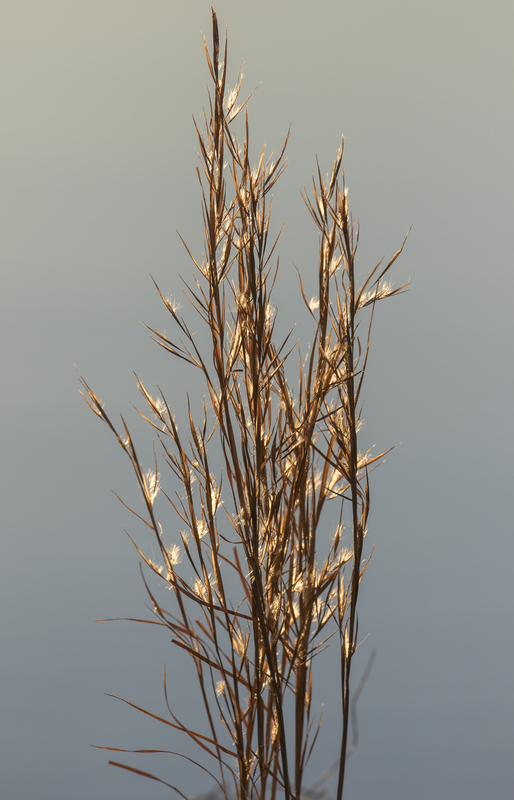 Very little sunlight penetrates these waters which means little or no aquatic vegetation grows in the lake. This, coupled with the acidity of Pungo Lake, means that there are few fish to be found in its waters. 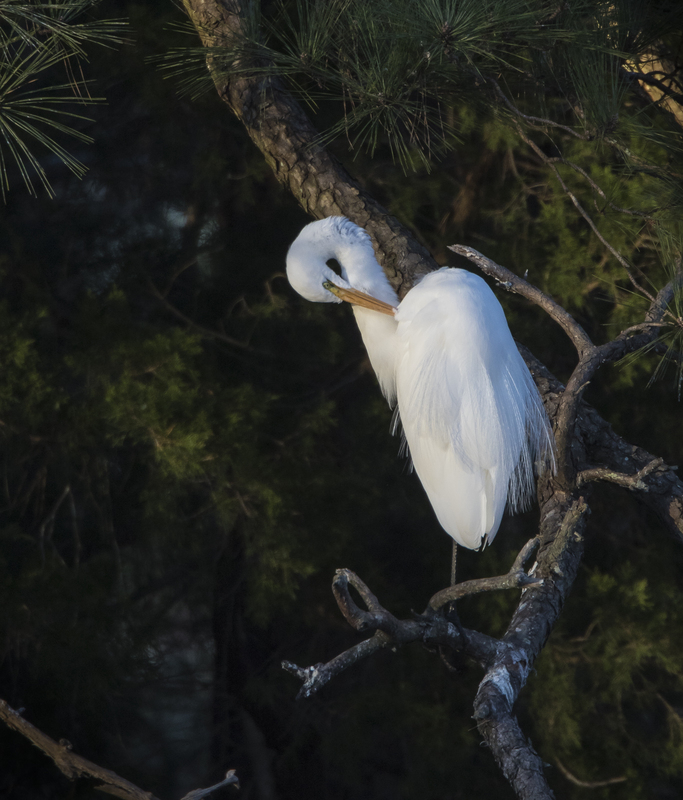 All of this dictates that this lake is used primarily as a resting and roosting area by the winter waterfowl, whereas Lake Mattamuskeet and Lake Phelps are also used as feeding areas. This also explains why you rarely see diving ducks, like Canvasbacks or Bufleheads, or fish-eating species, like Common Loons, on Pungo Lake. 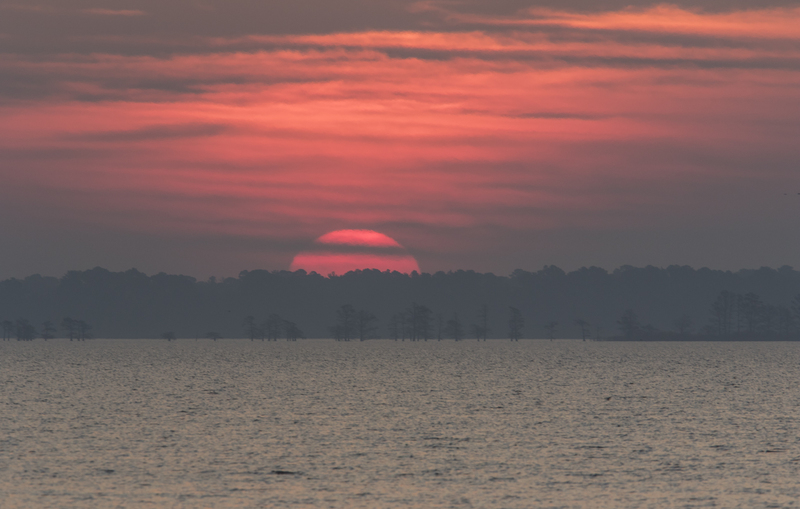 In addition to the open waters of the lake, there are over 400 acres of so-called Moist Soil Units (MSU’s) and over 500 acres of forested wetlands in the Pungo Unit. 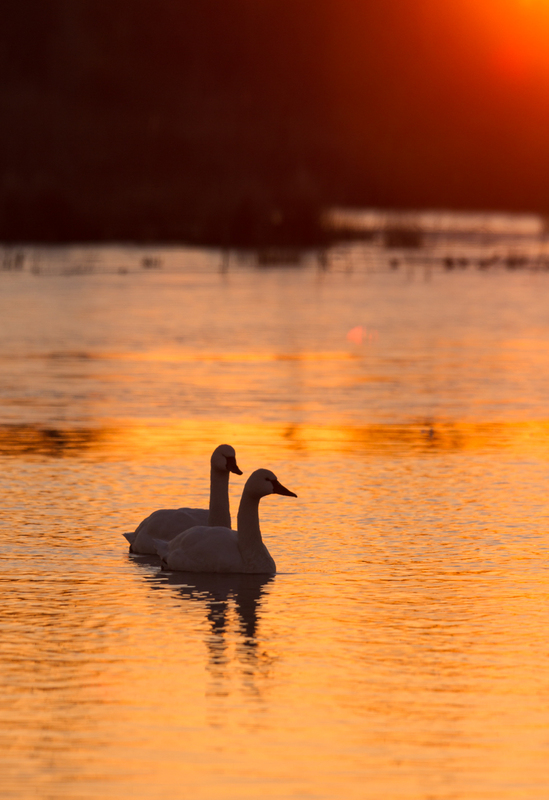 The MSU’s usually harbor thousands of waterfowl each winter as they provide an ideal combination of available food (in the form of aquatic vegetation, fish, and aquatic invertebrates) and shallow water. 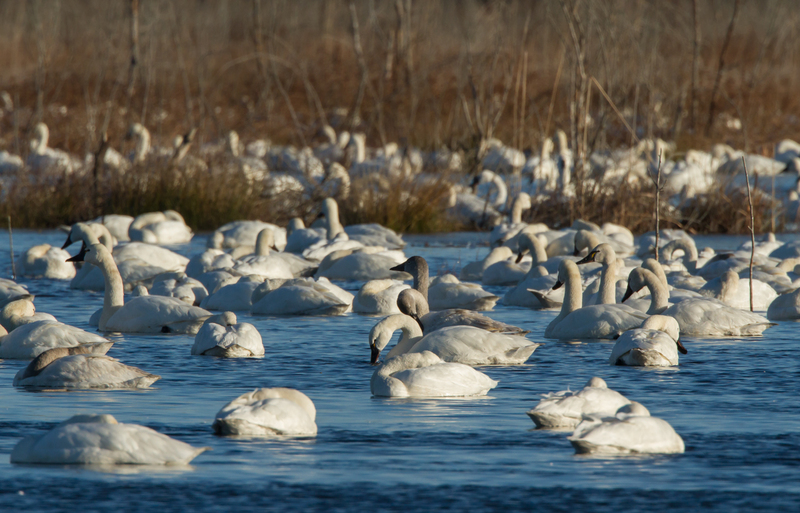 This winter, one of the MSU’s that is alongside a refuge road has been a great place for observing and photographing Tundra Swans. I have shared many photos from this particular spot in previous posts but was looking for something different. I usually start my days with clients at the observation platform on the south shore of the lake. It is a great place to watch the changing light and get some perspective of the lake and the surrounding landscape. As the sun starts to rise above the horizon there is often a parade of Red-winged Blackbirds flying out to the fields, along with the occasional Northern Harrier flying westward. 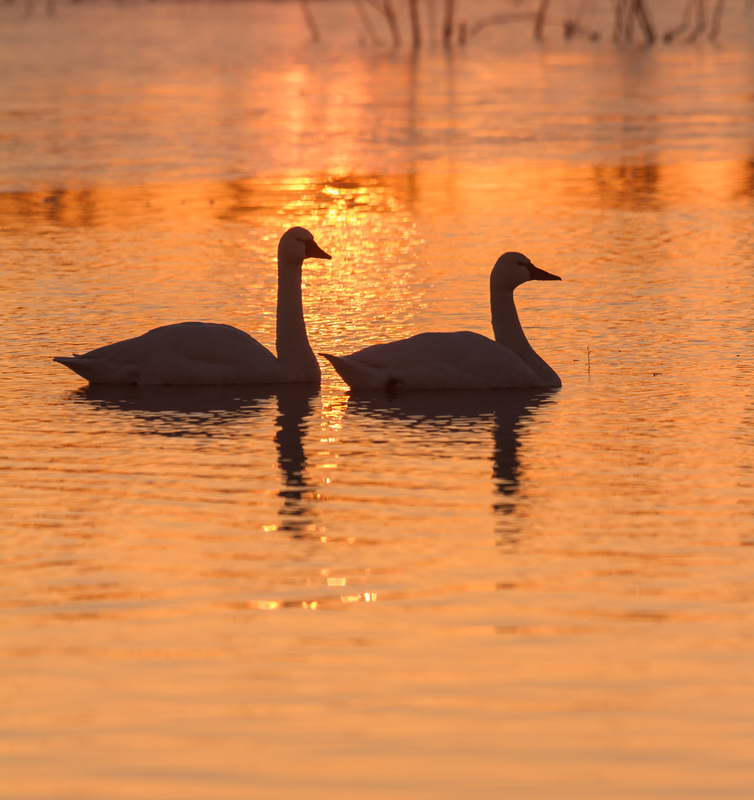 This means I rarely see other areas of the refuge at that moment of the magic light of sunrise. 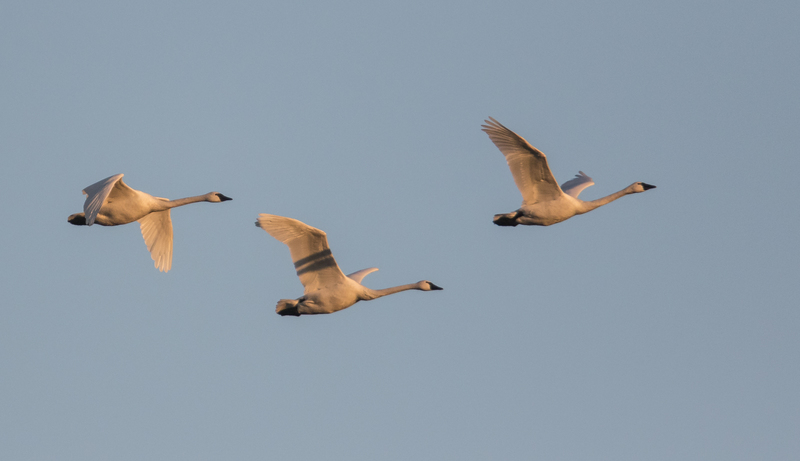 But I started this day in a different spot, the impoundment known as Marsh A, a location I hoped would provide some striking silhouettes of Tundra Swans. The key is to get to your site well before the sun comes up. 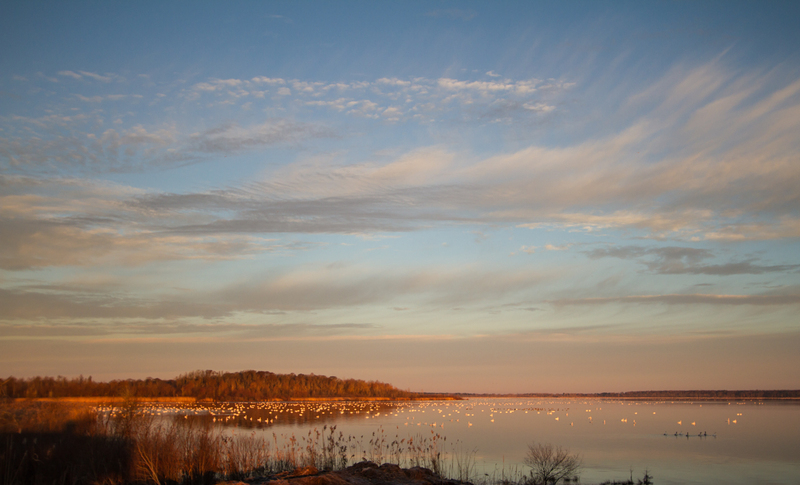 So, I positioned my car where the sun would come up behind a large flock of swans on the impoundment. 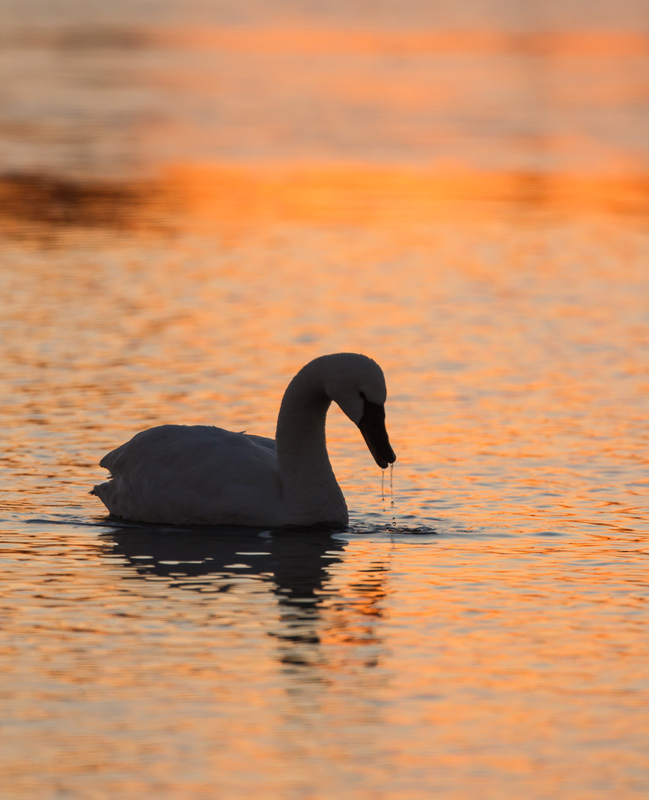 Some of the swans were slowly swimming about, perhaps claiming their favorite spots. The changes in light start out slowly at first with the scene initially dominated by a blue-gray palette having only a hint of gold. 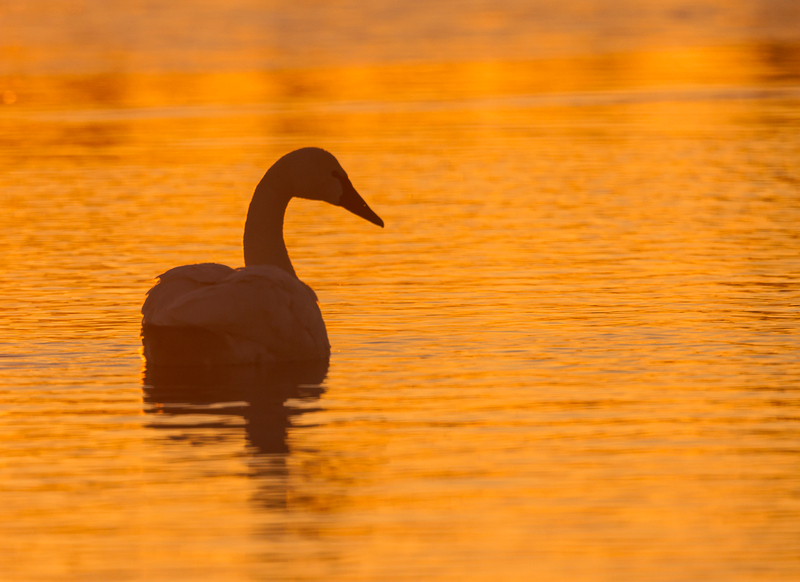 As an American Coot swims by in front of the swans, the golden hues start to cover more of the water surface. 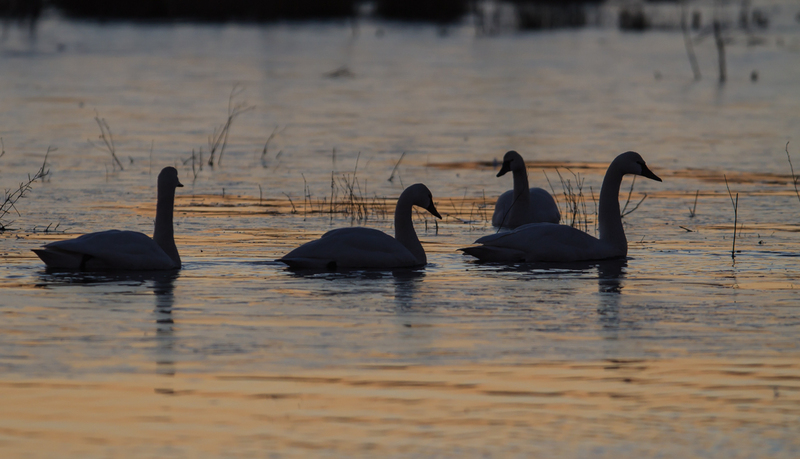 The glow soon begins to flood the sky and the water below, giving the swans a more perfect shadow of themselves. They seem to respond with an increase in activity and interaction. As I scan the flock, a few are preening, readying their feathers for the start of a new day. 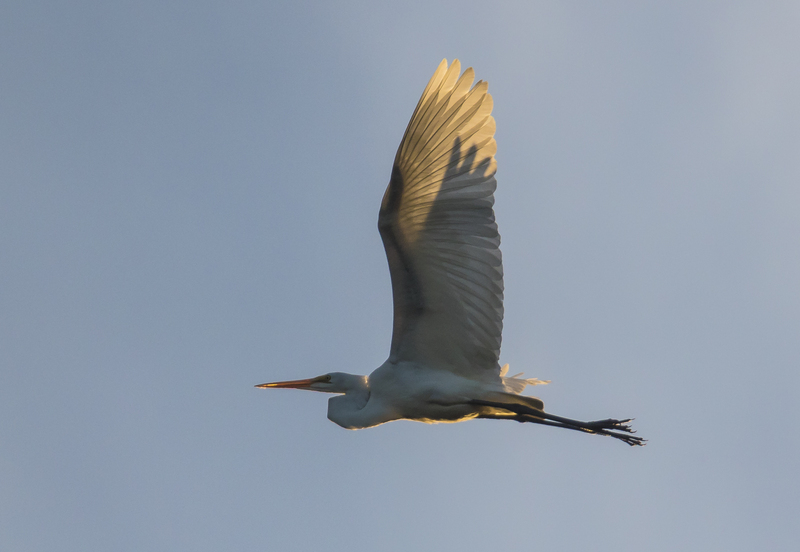 As increasing tones of orange signal the approach of the sun, I swing the camera back and forth looking for a subject before the bright beam of morning light breaks above the thin dark line of marsh bordering the far edge of the marsh. Before I can fully capture the fleeting radiance of the rapidly adjusting scene, the first rays of sunlight pierce through the trees lining the edge of the lake. 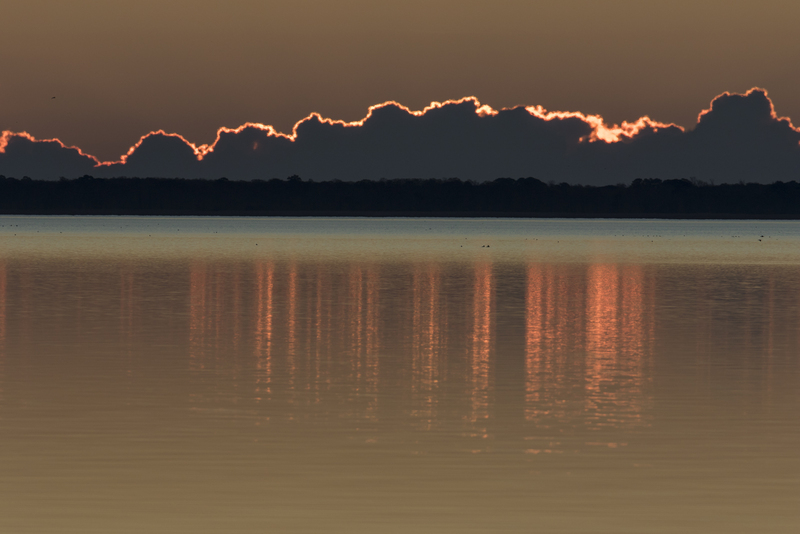 Suddenly, there is a dazzling golden-orange stripe on the water. Swans swimming near the reflected beam now appear extra black. 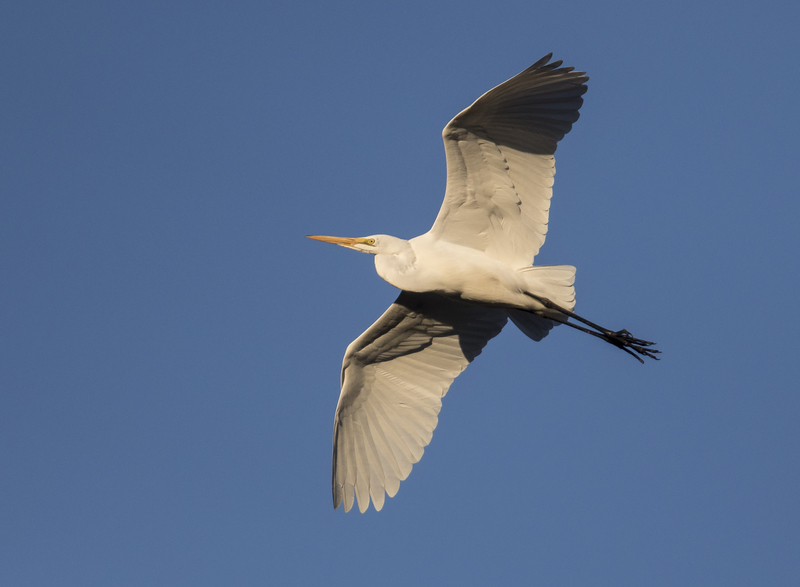 Their curved necks seem even more elegant in this light and their movements even more graceful. In less than fifteen minutes after the first orange beams struck the surface, the golden glow of a spectacular sunrise had faded. 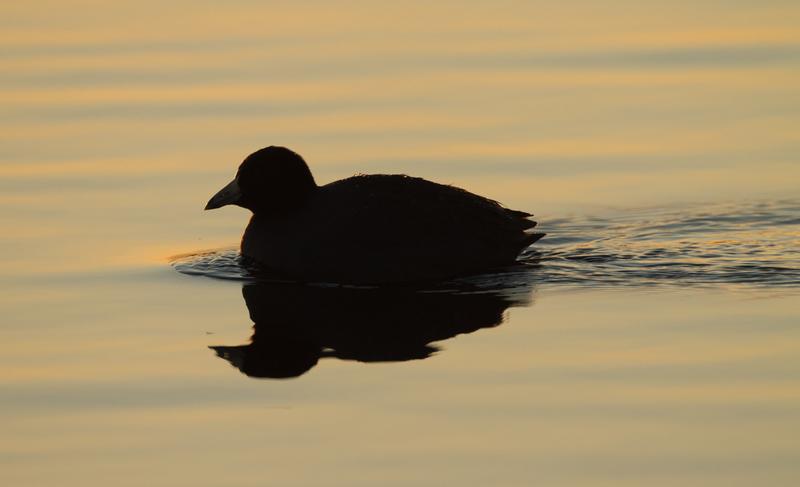 I decided to move on, looking elsewhere for some of the many species that tend to move about at this time of day. 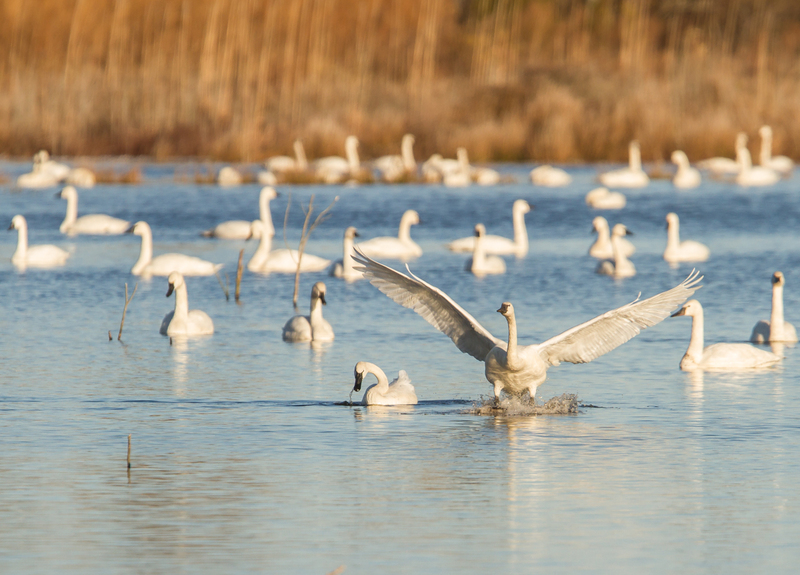 When I drove back by the impoundment about an hour later, the swans had settled into their morning routine of napping, preening, and discussing their plans for the day. And now the light was totally different. 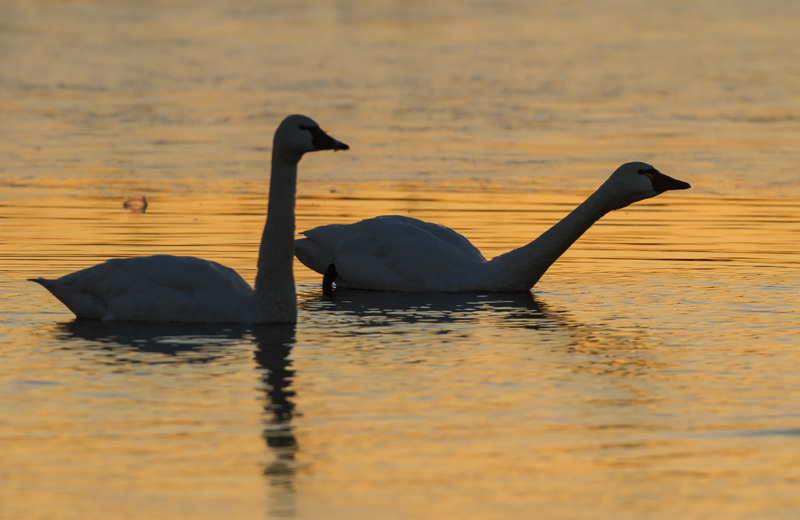 Their fleeting nature is one of the things that make sunrises so special. Each one different, each scene memorable, but brief. And on this morning, as is often the case, I had it to myself. 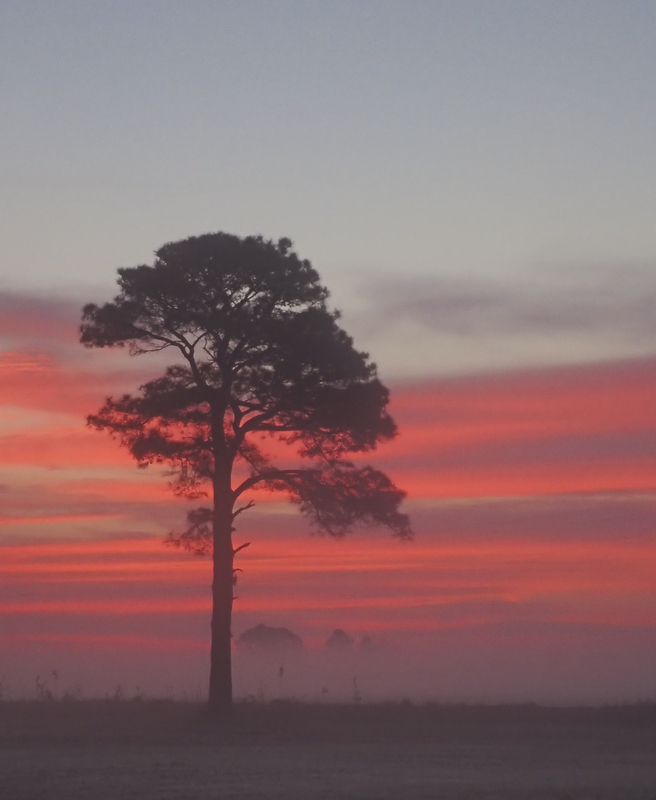 While I love sharing these moments with others, there is also something special about being the lone witness to the start of another day in a wild place like Pungo.